This challenge looked very time consuming at first, which is the main reason I put off making it until the last weekend. I was able to make the chocolate marquise the night before, then quickly make all three other components in 30 minutes (all the while making a huge mess in the kitchen). 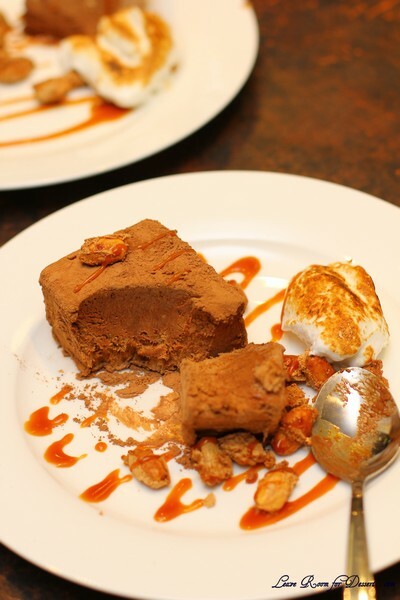 I still have some of the chocolate marquise in the freezer, and look forward to serving it (although in smaller portions, and probably with more spiced almonds). It was certainly a well liked challenge by all. Thanks Emma and Jenny! When the eggs are getting close to finishing, make a sugar syrup by combining the sugar and water in a small saucepan. Bring the syrup to a boil and then cook to softball stage (235F/115C). If you have a cake tester with a metal loop for a handle, the right stage for the syrup is reached when you can blow a bubble through the loop (as seen in the following pictures). With the mixer running on low speed, drizzle the sugar syrup into the fluffy eggs, trying to hit that magic spot between the mixing bowl and the whisk. When all of the syrup has been added (do it fairly quickly), turn the mixer back on high and whip until the bowl is cool to the touch. This will take at least 10 minutes. In a separate mixing bowl, whip the heavy cream to soft peaks. Set aside. When the egg mixture has cooled, add the chocolate base to the egg mixture and whisk to combine. Try to get it as consistent as possible without losing all of the air you’ve whipped into the eggs. We used the stand mixer for this, and it took about 1 minute. Fold 1/3 of the reserved whipped cream into the chocolate mixture to loosen it, and then fold in the remaining whipped cream. 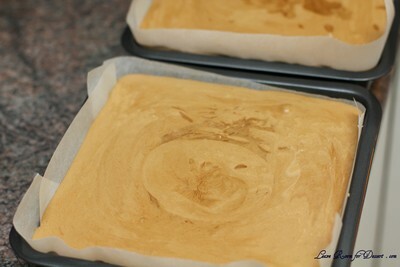 Pour into the prepared pans and cover with plastic wrap (directly touching the mixture so it doesn’t allow in any air). Freeze until very firm, at least 2 – 4 hours (preferably 6 – 8 hours). 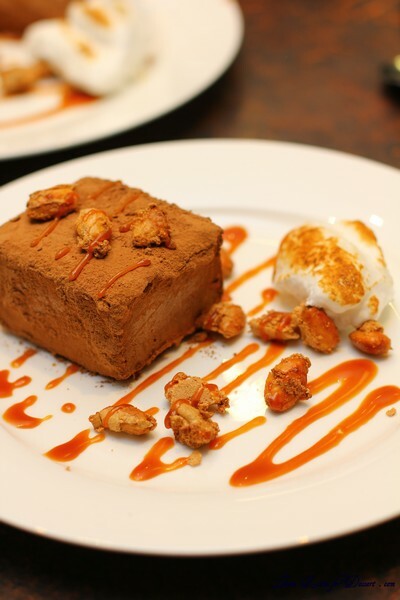 Cut it into cubes and roll the cubes in cocoa powder. These will start to melt almost immediately, so don’t do this step until all of your other plating components (meringue, caramel, spiced nuts, cocoa nibs) are ready. The cubes need to sit in the fridge to slowly thaw so plating components can be done during that time. They don’t need to be ready before the cubes are rolled in the cocoa powder. 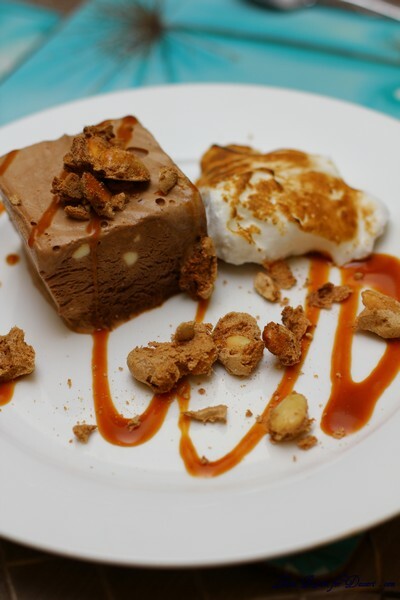 Plate with the torched meringue and drizzled caramel sauce, and toss spiced almonds and cocoa nibs around for garnish. You want to handle the cubes as little as possible because they get messy quickly and are difficult to move. However, you want to wait to serve them until they’ve softened completely. 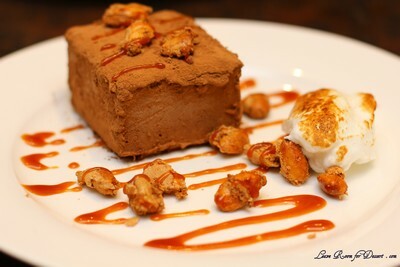 The soft pillows of chocolate are what make this dessert so unusual and when combined with the other elements, you’ll get creamy and crunchy textures with cool, spicy, salty, bitter, and sweet sensations on your palate. Place the chocolate in a small mixing bowl. In a double-boiler, warm the cream until it is hot to the touch (but is not boiling). Remove from the heat and pour over the chocolate. Allow it to sit for a minute or two before stirring. Stir until the chocolate is melted completely and is smooth throughout. Set aside until cooled to room temperature. 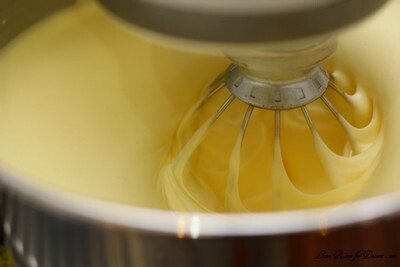 Do not refrigerate, as the base needs to be soft when added to the marquise mixture. If you make it the day before, you may need to warm it slightly. Whisk it until it is smooth again before using it in the marquise recipe. Servings: Makes about 4 – 5 cups of meringue. If you aren’t planning on serving *all* of the marquise at once, you might want to scale this recipe back a bit. Combine the egg whites, sugar and vinegar in the bowl of a stand mixer. Using your (clean, washed) hand, reach in the bowl and stir the three together, making sure the sugar is moistened evenly by the egg whites and they make a homogeneous liquid. Over a saucepan of simmering water, warm the egg white mixture. Use one hand to stir the mixture continuously, feeling for grains of sugar in the egg whites. As the liquid heats up, the sugar will slowly dissolve and the egg whites will thicken. This step is complete when you don’t feel any more sugar crystals in the liquid and it is uniformly warm, nearly hot. Remove the mixing bowl from the saucepan and return it to the stand mixer with the whisk attachment. Whisk until you reach soft peaks. 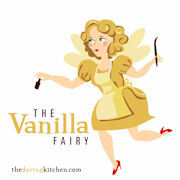 In the last 10 seconds of mixing, add the vanilla to the meringue and mix thoroughly. When you’re ready to plate the dessert, spoon the meringue onto a plate (or use a piping bag) and use a blowtorch to broil. In a heavy-bottomed saucepan, combine the sugar and water on medium-high heat. 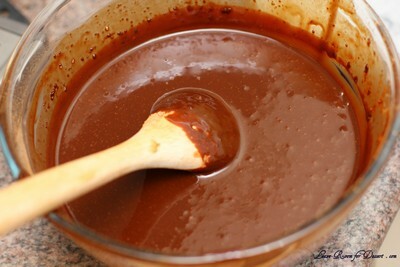 Boil until the water completely evaporates and the sugar caramelizes to a dark mahogany color. Working quickly, add the cream to the darkened caramel. It will bubble and pop vigorously, so add only as much cream as you can without overflowing the pot. Return the pot to the stove on low heat and whisk gently to break up any hardened sugar. Add any remaining cream and continue stirring. Gradually, the hard sugar will dissolve and the caramel sauce will continue to darken. When the caramel has darkened to the point you want it, remove it from the heat. Add the salt and tequila and stir to combine. Set aside until ready to serve. Preheat the oven to 350F. Line a sheet pan with parchment paper or foil. In a small bowl, combine the sugar, cinnamon, cayenne, and salt. In a larger mixing bowl whisk the egg white until it’s frothy and thick. Add the spice mix to the egg white and whisk to combine completely. Add the nuts to the egg white mixture and toss with a spoon. Spoon the coated nuts onto the parchment paper-lined baking sheet. Bake the nuts for 30 minutes, or until they turn light brown. Allow the nuts to cool completely and they will get very crunchy. Set aside until ready to serve. Filed under Cakes, Slices and Biscuits, Chocolate, Daring Bakers, Dessert, Egg Whites, Egg Yolks, Ice Cream, Recipes. You can follow any responses to this entry through the RSS 2.0 feed. You can leave a response, or trackback from your own site. I am always excited to see what you’ve done! This one looks totally delicious, that caramel sounds interesting. I might have to try the almonds. This dessert was just beautiful !!!!!!! I had a piece which didn’t have the cocoa coating, as I find cocoa a bit bitter. I could certainly eat this one again, hint, hint!!!!! Whipping all those components up in 30 minutes is an amazing feat – well done! It’s nice to hear you’d make it again too. Wonderful job on this challenge! It looks absolutely professional. I didn’t try to make the spiced nuts so I can’t comment on how good they were, but they certainly look delicious! Wow! This was an amazing challenge! So many components. Your presentation is lovely and I bet it tasted divine! 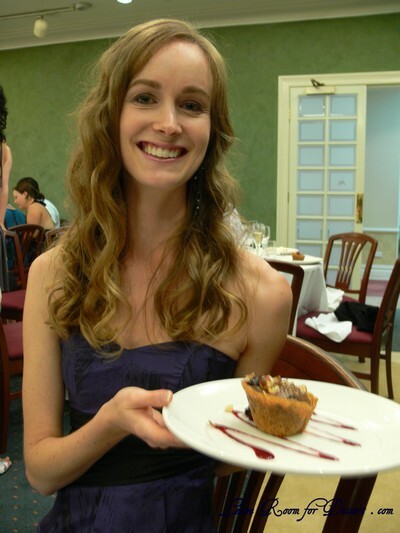 Love the way you plated the Marquise, looks really elegant. I attempted the nuts, but burnt them and didn’t have time to get any more. Anita this looks so amazing! Your presentation is always faultless. This looks delicious!! Great job on the challenge, I am so sorry that I missed it. But from reading everyone’s posts about how they made giant messes in their kitchens, maybe its a good thing, haha. Wish I could have tasted some, though!